...is an integral part of riding and definitely when one is helping organize an endurance ride. So last Sunday, I gave up a training day and Daniel and I headed to the trails for some needed maintenance. Several work places had been identified by Trace Tribute's Ride Manager, Angie Fura. We had GPS coordinates and we headed to those spots. 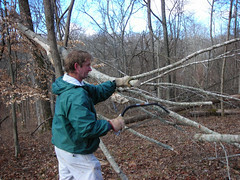 Due to National Park Service regulations, we were only allowed to use hand tools to work on the trails. Around noon, we met up with Angie and David and continued working with them for the rest of the day. We spent several hours and got some good work done on the trails for the enjoyment of others and in preparation for the Trace Tribute Endurance Ride to be held April 7, 2007. More pictures of our work can be found on my Flickr Account.